Denise and Fulton Lovin were all smiles at Sunday’s soft opening. The bar area will be open to both guests at the hotel and to the general public. A soft opening of the Horton Hotel in downtown Boone took place on Sunday night with a select group of customers and friends giving the hotel and bar a test run before the official opening on February 13. Guests enjoy some of the first drinks served as well as menu items. Sunday saw some of the first overnight guests register. Once the hotel is open, the bar area last call will be at 10 p.m.
“A lot has been leading up to last night. It was invitation only, we had six rooms stay here overnight and we also had some guests come in and enjoy the lounge space and see some of the open rooms that were not occupied,” said Andrea Morton, the Director of Hotel Operations, on Monday morning. Morton said that each customer filled out a questionnaire about their experiences, highlighting the positives and negatives for the hotel staff to build on. Around 40 people took part in the soft opening with a little under 20 of the employees on hand for the night, including all of the front desk and housekeeping staff and most of the bar staff. Several of the overnight guests also complimented how comfortable the beds and the sheets were that allowed for them to get a great night sleep. A great time was had by more than 40 guests that got to see the hotel in action during their soft opening on Sunday. Front desk staff members: Maria, Gentry, Foss, Alex, Denise Lovin, Claudia and Andrea Morton. The first customers of the new Horton Hotel got to experience the elegance and beauty of the completed project first-hand on Sunday night with a special group of guests and friends visiting the hotel and bar. 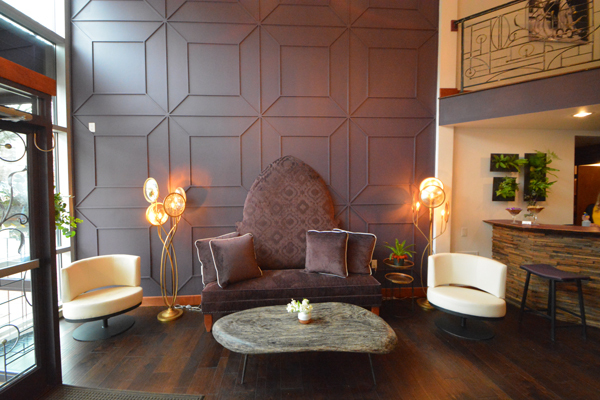 The Horton Hotel will officially open for the general public on February 13. Located at 611 W. King Street in downtown, the building was originally constructed by H.W. Horton in the 1920s. At the time the building was constructed it was home to a Studebaker car dealership and was built specifically for Spainhour’s Department Store with apartments upstairs. Keeping the Horton name alive was an important decision for hotel owners, Fulton and Denise Lovin. Fulton attended Appalachian State University and when he graduated, he decided to stay in Boone. He has previous experience with property management, including operating Pads for Grads for years. Fulton and Denise have White Fence Farm across the state line in Trade, Tennessee and also rent that out for vacations and as a wedding venue. The vision for the Horton Hotel started coming together around three years ago and construction officially broke ground in May of 2017 for the 9,000-square-foot project. As you enter the lobby, the friendly face of Andrea Morton, the Horton Hotel Director of Operations, will greet you. Inside the lobby is a lounge open to both the public and guests of the hotel, as well as some wonderful décor that was a lot of the vision of Fulton Lovin. The bar area will feature craft beers, classic cocktails and a small appetizer menu. Hunter Hallmark is the Director of Food and Beverage and will be serving some delicious wines, beers and small, shared plates to patrons at the hotel and the public. Denise said that Hunter was most recently working as a private chef on yachts and has over 15 years of hospitality service before returning back to Boone to handle the food and drink preparations for the Horton Hotel. “I’m excited about the space and I just need one thing: Customers,” said Hallmark. The hotel will feature 15 guest rooms and has five floors, including the lower level floor where every room is pet-friendly. The lobby and bar are on the first floor with rooms on the second floor, suites on the third floor and a rooftop bar. Inside the rooms and suites, there is a lot of infused history and pieces of High Country heritage adorning the walls. Each room also has different themes and designs inside. Many of the hand-crafted designs found throughout the hotel were created and built by Fulton himself, including a unique fireplace setup that was pieced together in the lobby. Another unique characteristic for the Horton Hotel is how the construction crews found a way to install an elevator in a nearly century-old building so guests do not have to climb multiple flights of stairs each time they come in or leave the building. Denise, who retired from a psychologist position at Appalachian State, has had nothing but positive support from everyone around the project. Max and Harry Schrum of Taylorsville were the general contractors for this project and ran into a few challenges along the way, as is typical with renovating any building as old as this one. The brothers have worked together on construction projects since 1991. Harry, who has been doing this for 40 years, said these challenges were nothing new in his line of work. “This was a tough one, the elevator shaft being the major challenge. The rooftop bar as well, the same steel in the footers in the basement run to the top of the building,” Harry said. Parking for the Horton Hotel is located directly behind the building on Howard Street and the last call at the lounge will be at 10 p.m.
For more information and to reserve a room, visit their website at https://thehorton.com/. The front entrance of the Horton Hotel. Lobby area features a unique design. The check-in desk for hotel guests. A section of the bar area. View of the hotel lobby from the second floor mezzanine. Views of some of the 15 rooms available to customers. Each room is uniquely designed with different looks for guests. Each bathroom has its own unique layout. Rooftop bar with seating that overlooks the Appalachian State campus and downtown Boone.